Green crafts for kids are simply my favorite! What can be better that helping your child learn while developing respect for nature and our surroundings at the same time! What is even better. Using green kids crafts, or any kids crafts is a fantastic way to keep your child engaged once school is out and you need summer activities for you little one! I have devoted this site to ideas to teach and educate kids. As it is a music site with tips for parents, we naturally have many music crafts for kids ideas. But in this post I am excited to share a great find for green crafts for kids! Have you heard about these Green Kids Crafts ? As a teacher I know that mixing fun and education s always a winning combination for kids. These wonderful green crafts for kids will keep your child busy and motivated to learn! 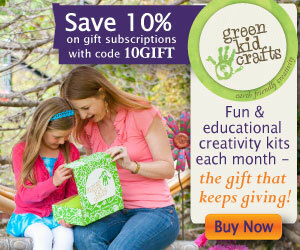 Your child will receive a green crafts packet each month. Each packet has a box with green projects for your child to complete. The box has enough materials for your child to complete 3-4 projects out of one box. This way they can have a weekly fun assignment out of each packet received. The themes of the boxes are different. The goal of each project is to engage your child in creativity, self-reliance, and green living. They will be learning to make things themselves while engaging in nature and creativity. Getting a project that needs to be assembled, put together and “figured out” develops lots of critical thinking. Working with kids, I know that they love it when things are “secretive” and there is an element of surprise. These green crafts for kids provide that. It provides an activity that is that actively to keep kids busy while it works on a child’s develpment (as opposed to turning on the TV). It helps your child feel comfortable exploring the unknown. The different themes allow your child to explore different interests through green crafts for kids. I love the idea of getting a subscription and exploring a new craft theme every month. This makes for easy home play planning. Wondering what to do with your child on a rainy day or in those hot days in the middle of the summer-here is a fantastic project for your child! These green crafts for kids are appropriate for ages 3-9. his is really the best time to explore crafts with your child. This is the time they absolutely love it. Are These Green Crafts for Kids Well Priced? Green Kid Crafts products are wonderful choice for families. I find that they are reasonably priced and affordable. I think the best is to aim for ONE green craft idea every month. the bigger kits are prices at around $20.00. They have more variety for exploring. At the same time they will keep you child busy for awhile. You wouldn’t have to think about another one for at least a few weeks. I find that there are some low-proced items. However, I don’t see that they are not worth the value. I would personally get a kid (all of the ones above). The cool thing about is that these green kids crafts give you lots of different ideas. Once you explore them you an start re-creating the similar green crafts for your child for free at home. There is one thing that I have strong memories from my childhood…doing things with my parents! Strangely, these exact activities are turning into my hobbies as an adult and are bringing me lots of joy! So, use that time! Make lasting memories with your child that will later become hobbies and a source for a fulfilled life! Don’t forget to let us know what you think in the comments! I like that they have themes. I think the green living one would be a hit here! Happy to see you linked at Super Sunday Sync!! Appreciate it! 🙂 I'm your latest follower. Thank you! Yes, I love that they have different themes and the crafts are never exactly the same. What a fun idea!! I would have loved this when my kids were younger!! I checked out the website…there is some reason cool stuff on there. I'll be keeping this in mind for gifts for my niece and nephews…they're at just the right age! Maria this is nice. I was looking at the website and I wondered what age group it was for. My son is 16 months and I would love to have some eco-friendly activities for him. 🙂 Thanks for linking up to Mommy Monday again. If you click on the website and go under Eco Products then Birthday Activities, there is a kit about water colors. I feel it's easy, can be great to do together and can also be fun for parties esp. if there are older kids. Check it out, let me know what you think. We have tried them before – they are good for parents who don't have a lot of time to hunt down projects! Yes, it can be a great tool for parents who do not have time to find projects or simply need ideas about interesting projects with their kids. I love that this is eco-friendly and that they have themes! This would be a great gift idea. I was ecstatic when I saw they deliver to Canada too! Awesome. Thanks for sharing! Yes, a great and unique gift idea indeed! Thanks for the update that they also deliver in Canada, this is great to let the readers know! My kids are older but I know at my house, we are really into re-purposed jars and containers. We like to use them for just about everything, including fun crafts.